On The White Princess, Henry and Lizzie grow closer together, and in Burgundy, a freak accident threatens to bring war. Here’s our recap of “Burgundy”. The White Princess delivers another drama packed episode with “Burgundy”. We follow our characters as they celebrate the birth of an heir, the threat of war, and the burgeoning relationship between Henry and Lizzie. The episode starts off with Lizzie giving birth. When she and Maggie are alone, she cries for her mother and mentions a curse. This causes Maggie much alarm because she seems to know that the Dowager Queen is a bit meddlesome with magic, but encourages Lizzie to push. Cecily runs to get Lady Margaret, who stands off the side, clutching her bible and rosary, praying. That is until Cecily says that the lady’s maids want to put Lizzie in a blanket and toss her around to “loosen the baby”. <--NO. NEVER. Lady Margaret puts her foot down and begins to talk to Lizzie through her labor about how she's giving birth to the future King of England, and all this pain will be worth it. Finally, Lizzie sits in a birthing chair and through gut-wrenching screams, delivers a healthy, crying baby boy. While she was birthing her son, Jasper and Lord Strange left on their trip to Burgundy to begin peace talks. The Bishop and Henry's stepfather advise him against sending Jasper because he's a "man of war" not a diplomat, but Henry won't be swayed. Jasper will go. It's not because he particularly believes in Jasper to complete the task, but he's punishing his mother for her flirtation with him. As they ride away, we see Elizabeth writing another letter to her sister in Burgundy, urging her to rise up and wage war agains the Tudors. Henry makes his way through the castle and speaks about how his son hasn't been born yet, and that maybe he should have visited Lizzie during her confinement. He even poses the question that maybe she's trying to kill the baby by not birthing him. I know it's true for the time period, but that made me want to slap Henry. She wouldn't try and kill her son. Threaten a Bishop? Absolutely. Kill him for real? No. Henry takes his frustration out on his squires by sparring with them and beating them badly. He only spares them when his mother runs out to him to tell him of the birth of his son. He runs for the castle with Margaret yelling after him that he can't see Lizzie because she's still in her confinement, but that doesn't stop him. In her birthing room, Lizzie sits up in bed, holding their son. Henry comes in and asks about Arthur and if there was a mistake or if he’s really a boy. To that, Lizzie pulls back his blanket and assumingely shows Henry that, his son is, in fact, a son. Henry asks if he can hold his son and while he’s holding him, he tells Lizzie that he owes her a great debt, which kills the moment immediately. Then Lizzie asks to see her mother. Henry agrees. Then he hands the baby to a wet nurse and tells her to feed him until he is strong. With that, he’s off to start ringing bells and starting a bonfire to celebrate the birth of his heir. When he’s out of the room, Maggie asks if Lizzie will see if Henry will release Teddy since he has an heir now, and Lizzie tells her that she’ll ask. Henry’s happy now, so they’ll have better luck getting what they want. In Burgundy, the letter from Elizabeth arrives. The Duchess of Burgundy tells her grandchildren that she has two letters, one bidding her to start way and a letter from the Tudor King, seeking peace. She knows the Tudors are sending someone to see her, and she tells Francis Lovell that she’s given him safety at her court. It’s quite clear that the Duchess doesn’t know what to do at the moment, so she’s content to let them stew for a while. Duchess Cecily rips up the Tudor letter and says that it’s time to take a stand. 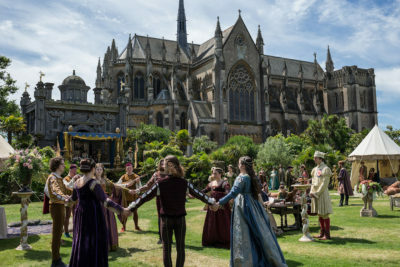 Elizabeth tries to appeal to Lizzie’s love for Richard, the former King, but Lizzie tells her that all that matters now is Arthur, and Richard is in the past. With that Elizabeth leaves the room. Margaret tells Elizabeth that he is the heir to the throne and will one day be a Tudor king. Elizabeth responds to her by saying that nothing is certain. She once had two sons destined for the crown, but they’re both gone now. 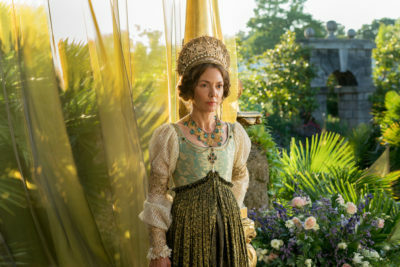 This causes Margaret to pause as Elizabeth turns to leave because Margaret is the reason that Elizabeth’s son(s) are dead. At this point, no one knows that Richard may still be alive somewhere. Later on, Margaret tries to force Henry’s hand about christening Arthur as soon as possible to legitimize his heir, but Henry wants to wait until Lizzie can come. However, she has to be sanctified first after a period of time since she’s given birth. Instead of obeying his mother directly, he tells her that he’ll speak to Lizzie. I’m so proud of Henry for taking little steps to stand up to Margaret. It’s still not enough, but it’s getting there. When Henry does approach Lizzie next, we can see that time has passed and the christening will take place in Westchester, away from Lizzie and before she’s able to travel. He presents Lizzie with a new badge for Arthur. It’s a combination of the Tudor red rose and the York white rose. Lizzie likes the badge but says that their mothers won’t approve. She goes so far as to say that she thinks they like the war between them. After asking Henry again why the christening has to be so far away, he reminds her that her mother is going in her place and she’ll be the Godmother to Arthur. She asks him to release Teddy, and he tells her that he’ll think about it while he’s away. Meanwhile, in Burgundy, Jasper warns Lord Strange of the Duchess of Burgundy. She’s tiny but she’s a politician. For the duration of their trip, Strange becomes a bit of a court jester for the Duchesses grandchild. He loses to the constantly and not because he’s letting them win either. At first Jasper has little luck talking with the Duchess, but he finally corners her on the grounds one day, and offers her peace, trading rights back, and a gold sovereign as a show of peace. He tells her that she tried to hand Henry over to Richard during the war, so she should have expected to lose something when he came into power. The Duchess of Burgundy reminds Jasper that she’s lost her husband, brothers, and sons. While Henry is away, Maggie comes to Lizzie again and asks her about Teddy. Lizzie promises that as soon as she has been blessed they’ll go and see him together. Maggie brings up the curse again, and Lizzie tells her it was something she did with her mother. A curse on the Tudors to end their male line. Lizzie assures Maggie that Teddy is safe from that, and the curse didn’t work anyway because Arthur was born healthy. In the Tower, Teddy is scared and alone. He wants to go home, and Maggie promises him that she’ll get him out and they’ll go live far away from the city together. He looks completely crushed. During this, Arthur’s christening is happening, and afterward, Elizabeth is called back. It turns out that Margaret has proof that Elizabeth wrote the letters calling for the attack on Henry’s life, and Elizabeth is going away for a long time. When they arrive back in Westminster, Cecily gets out of the carriage holding Arthur and Lizzie takes her son. Cecily ignores Lizzie’s question about where her mother is and instead tells her that she’s now engaged. Finally, she tells Lizzie to ask her husband about their mother if she wants to know where she’s at. Lizzie confronts Henry, and he explains everything to her and that her mother is now locked in the dungeon. Lizzie begs for him to send her mother to an abbey. Henry tells Lizzie to prepare for her coronation because it’s going forward. He doesn’t say it then, but eventually he does send Elizabeth to Bermondsey Abbey where she must prayer four hours a day and gets two hours of yard time. Jasper is brokering peace with the Duchess of Burgundy. He’s trying to get her to understand that Henry will be a good king. He’s loyal and honest. He does what he says and says what he means. All to which the Duchess says that it sounds like Henry would make a fine dog. He then tries to appeal to her loses by telling her if they have peace, she won’t lose anyone else from her family. The Duchess walks away without answering him. As she’s preparing for her coronation, Lizzie has to deal with Cecily being ridiculously annoying. She’s saying that all the Queens dresses are ugly and her marriage is a love match, even though she’s literally talked to the man for a day. Lizzie goes to Henry that night to speak to him in his chambers. This scene is the absolute best, and it allows us to peel back the layers of their characters. They spend so much time wearing the masks their mother’s have provided them, that they don’t know how to be who they truly are. Henry explains that he never wanted to be king, but it was something that was always expected of him. He hates being the subject of death threats or that his child is in danger of the same. Lizzie explains that she’s what her mother made her as well. Henry says that he knows that she might not love him, but he asks her to promise not to plot against his life. She can’t promise this because earlier that day she sent a letter to her mother, asking for help. Her mother gets her letter and writes Lizzie back, telling her to write to her aunt, the Duchess of Burgundy, and call for war. If it comes from Henry’s own wife, no one will shy away from it. She asks that Lizzie come and visit her at the abbey. Margaret meets with Lizzie, and they look at baby Arthur. Margaret tells Lizzie that she’s happy they can be friends now. Since she has Arthur, she knows that an attack on Henry is an attack on Arthur. She knows Lizzie loves her child, so she has no concerns for her loyalty. In that moment, Lizzie realizes what their child means. Her allegiances have shifted, and it hits her all at once. At Lizzie’s coronation, the banners of the one’s that Henry had commissioned. Red and white rose united. When it’s over and they’re seated on their thrones, Henry asks if she feels any different, and she says she feels like she’s aged a thousand years. After she’s given Arthur, Henry tells her that if he is able to pass the throne to his son, he may think that. Their enemies will continue to try and kill him, and something may happen to Arthur. Lizzie grabs his hand and tells him to never say that again. Back in Burgundy, Jasper and the Duchess have struck up an unlikely friendship. She asks him what he wished he had in life, what he missed out on. She tells him that he longs for a true companion, and that it’s not too late. Another York/Tudor union could be on the horizon, heavily hinting that it would be between them. However, all things must come to an end, and when her stepdaughter, Mary, decides to race Lord Strange on their horses, it comes crumbling down. Mary falls off her horse and breaks her back. She dies later that night, and even though it’s not Jasper’s fault, the Duchess of Burgundy blames him and yells for him to get out of her home. In the night, Lizzie goes to Henry’s room with Arthur. She lays the baby down and cuddles next to Henry. He smiles as he rolls over and holds her. The York princesses are strategically married off to strengthen the Tudor cause, but further political challenges are on the horizon. When King Henry finds himself back on the battlefield to protect his reign, Lizzie learns that the threats they face may be closer to home. The episode is titled, “The Pretender”, and looks to be filled with drama! Will Henry and Lizzie continue to grow closer together or will their scheming mothers push them apart once more? The White Princess airs Sundays on Starz at 8/7c!